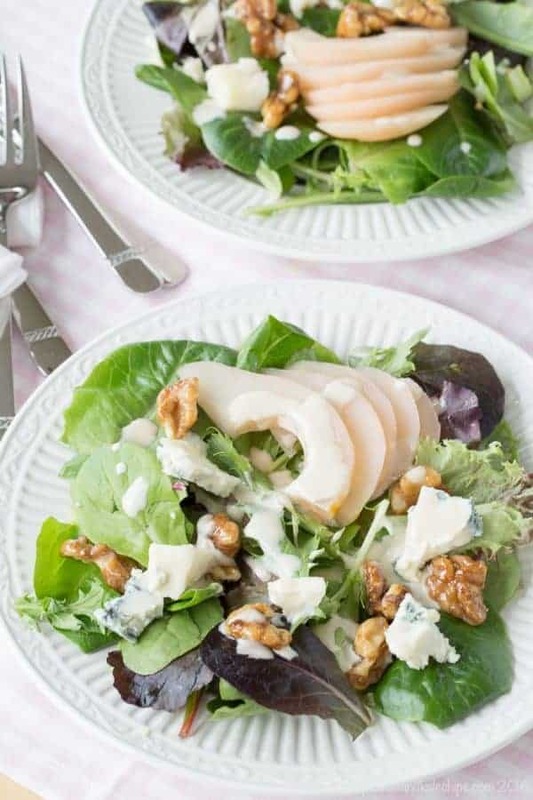 This delicious brunch salad is topped with poached pears, blue cheese, honey glazed walnuts, and a light and creamy sherry dressing. 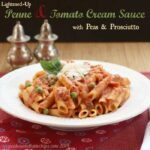 Also perfect for a light meatless dinner or side salad. Gluten free! With Mother’s Day coming up, #SundaySupper is paying tribute to our favorite ladies with a menu of Mom’s Favorite Recipes. 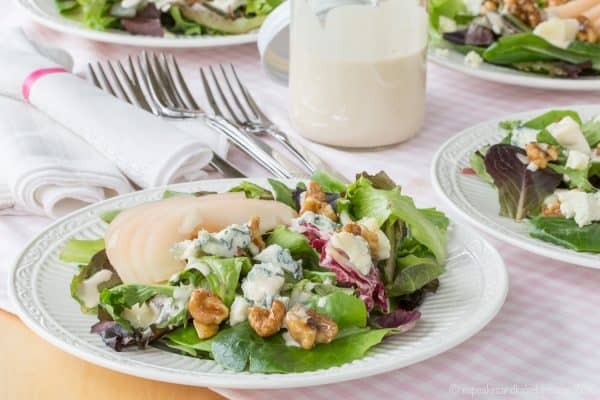 Topped with poached pears, glazed walnuts, blue cheese, and a simple sherry dressing, my mom loves this simple, fresh, and delicious (and lightened-up) Italian Country Salad. I love my husband, and we had some pretty fun dates back in the day. Trips to New York City to go to museums or shows or concerts or baseball games. Dinner at fancy restaurants. Days at the beach followed by evenings on the boardwalk. Or even just going to the movies and getting ice cream. And even now, though we have to get a babysitter and, you know, basically go through all of the same preparation and coordination as they need for a visit by the Pope to the White House, we still try to enjoy some kid-free nights out together. But I cannot tell a lie, there’s someone else with whom I used to go out for date nights pretty regularly, and we always had a blast. And this person is actually still a huge part of my life. After I graduated from college, I moved back home since my job was nearby and rent for apartments in New Jersey is ridiculous. In the years I was living at home, my sister was in the teenage stage of being too cool for school and little miss social butterfly, so whether it was hanging out with friends, cheerleading, or whatever teenagers did back in the early 2000’s, she didn’t want to be with her mom and much older sister on Friday nights. My stepfather was working nights at that time. And, well, I was 21 going on 40, and working a job that at times was exhausting. So after a long, hard week, mom and I often had a date night on Fridays. We would go to lots of different places, but we had two staples. One was a place that we considered a Mexican restaurant, though they really had a little of everything, and we would split a small pitcher of sangria and a Mexican pizza. Well, I always ordered this. And she sometimes ordered this. But this is something she enjoys, and it’s actually my favorite salad ever. It’s the Italian Country Salad from Old Man Rafferty’s. I did give it a few little twists though. 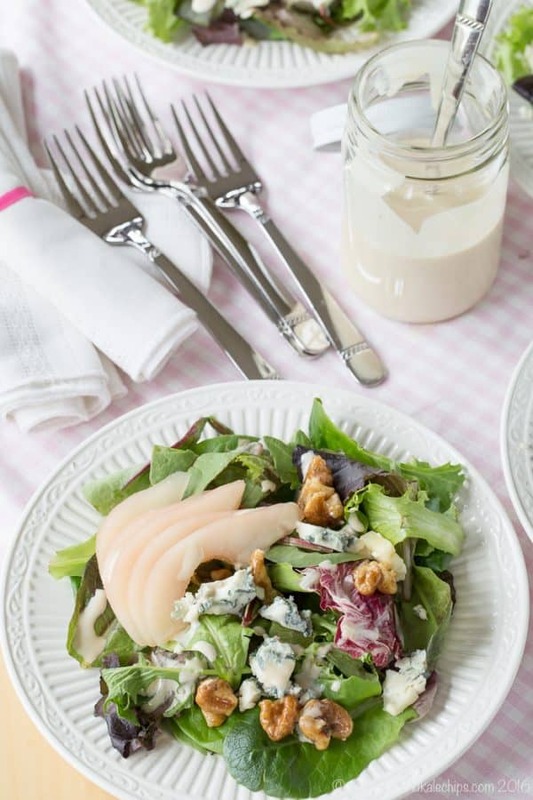 First, I poached the pears in White Zinfandel, which is her favorite, with just a bit of honey for some sweetness, as opposed to the mountain of sugar I noticed in most poached pear recipes I found – this is a salad, not a dessert. 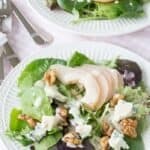 In the Rafferty’s salad, the thick coating on the walnuts is super delicious, and super sweet – I again went with just some honey and a touch of cinnamon, and it still adds plenty of sweetness and crunch, plus the toasty walnut flavor. Blue cheese, well, no changes needed there – use your fave, whether it’s a classic Wisconsin blue or a Gorgonzola for the true Italian country touch. Then I drizzled it with a light Creamy Sherry Greek Yogurt Dressing versus the sherry vinaigrette on the original salad because I just love using Greek yogurt to make my salad dressing creamy and smooth. You guys, I feel like I am back home in New Jersey, sitting on the patio of my favorite restaurant, glass of Riesling in hand, eating my favorite salad, with one of my favorite people – my mom! 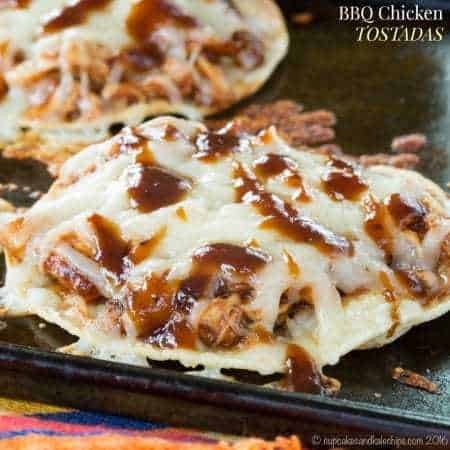 One quick note – from this recipe you can make eight side salads or four meatless mains, but it’s also a fabulous base if you want to add grilled chicken, steak, or shrimp. I’ve done all of the above! 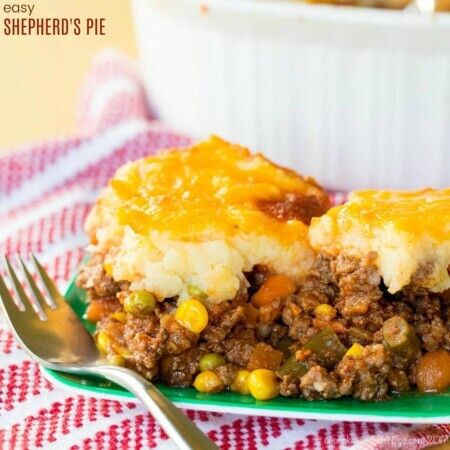 Then check out all of the #SundaySupper culinary tributes to mom at the bottom of this post! And then go make this Italian Country Salad. Trust me! What is or was your favorite way to spend time with your mom? Stir together the white wine, honey, and lemon juice in a large saucepan. Bring the mixture to a simmer over medium-high heat and add the pear halves. Poach the pears, uncovered, for about 10-12 minutes, until they turn tender, but not mushy. Remove from the heat and cool completely while still in the poaching liquid. 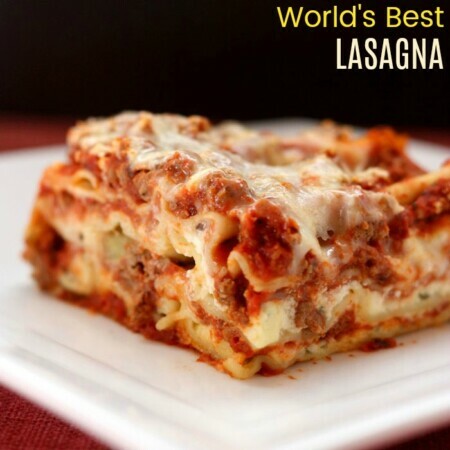 Can be made ahead and stored in the refrigerator overnight. Line a baking sheet with wax paper or a silicone baking sheet. Set aside. Heat a small skillet over medium heat, then add the walnuts and toast for 2 or 3 minutes. Add the honey and cinnamon and stir to coat evenly. Pour the nuts onto the prepared baking sheet and quickly separate the nuts. Let cool completely. Combine the ingredients in a bowl or jar and whisk or shake vigorously until combined and smooth. You will probably have more than you need. Save it for another use. It will keep in the refrigerator for several days. Thinly slice the poached pears. 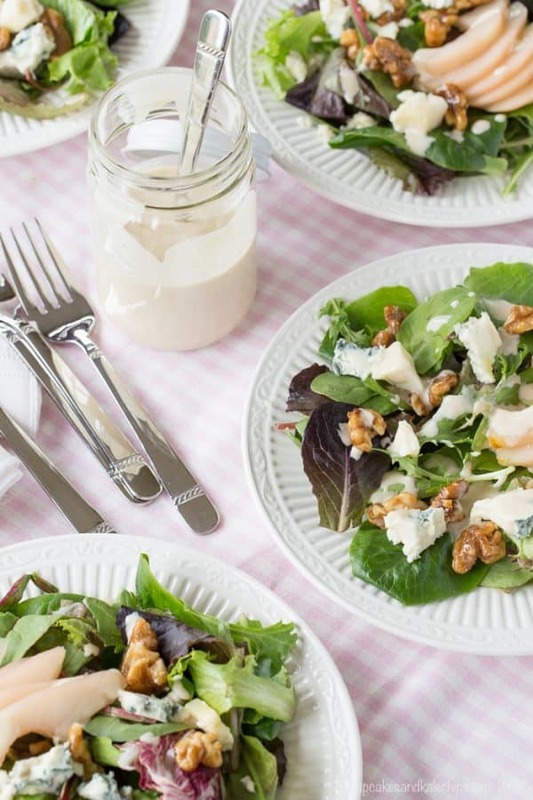 Divide the mixed greens between eight side salad plates or four entree plates. 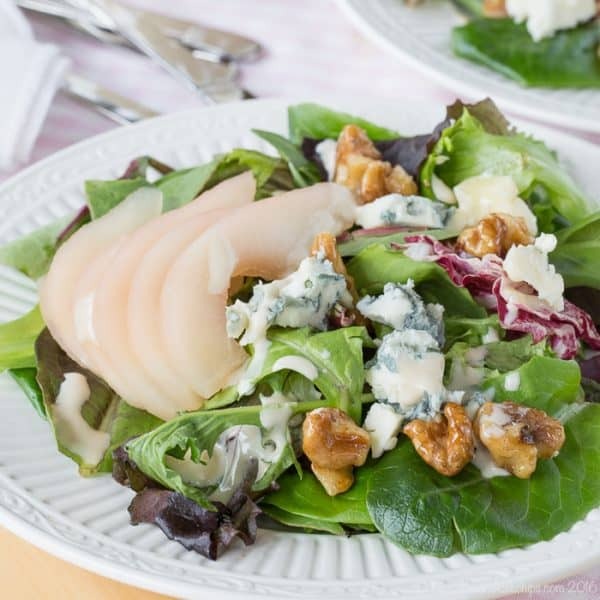 Then top with pear slices, honey glazed walnuts, and blue cheese, and drizzle with the dressing. 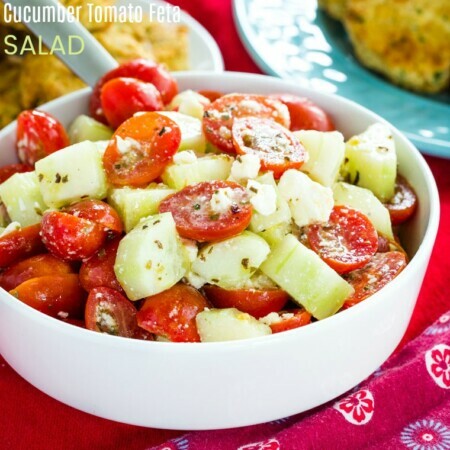 This recipe will yield 8 side salads or 4 entree salads. Nutritional information is calculated based on side salad portions. Enjoy this Italian Country Salad recipe! Looks delish! Thanks for sharing this with us! I must try it! Thanks for sharing this great salad and your memories with mom. I miss date nights with my mom too. She is a few hours away now, and when we are there, she wants time with the grandkids! First of all, stunning salad! And secondly, I love date nights with my mom 🙂 I hope my daughter one days looks forward to a few Friday nights with me too! This looks great! I’m not a blue cheese fan but my husband loves it! He’d be happy to have this as a starter. It would be great with goat cheese or Brie too! What a nice combination of flavors and ingredients! 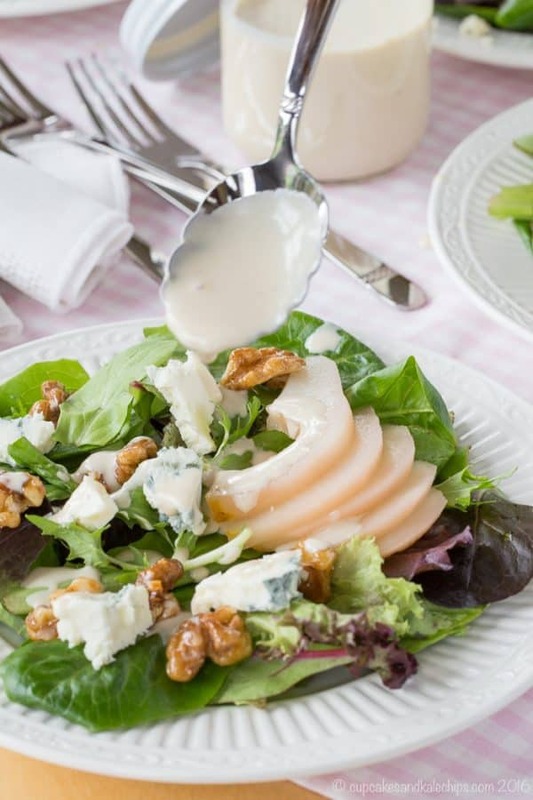 The Greek yogurt dressing must taste wonderful with the poached pears. Thanks Lynne! It is a tasty combo! Date night with Mom is priceless. You made me remember the weekend trips I took with my adventurous mother. I really enjoyed reading through your post. Very touching and heart warming. Your salad is classic delicious! Thank you. Thank you Kim! My mom and I used to take weekend trips too. It is such a special time!